TJN this morning publishes a short new book entitled The Finance Curse: how oversized financial centres attack democracy and corrupt economies. It's an important new publication of ours, which we'll be referring back to on several occasions. The book, co-authored by TJN's Director John Christensen and Nicholas Shaxson, is available for free here, in pdf format. It is also available on the Kindle e-reader, for a nominal fee, here. This book emerges from our long-running work on tax havens, and differs from much of the work that we've done in the past. Our work on tax havens has generally focused on the global impact of tax havens or secrecy jurisdictions: that is, the impact that one haven has on the citizens of other countries, elsewhere. The Finance Curse, by contrast, looks at the domestic impacts of hosting an oversized financial centre. We find that finance is beneficial to an economy up to a point, but once it grows too large a range of harms start to emerge. Much of the damage, and the underlying processes at work, are similar to those found with a Resource Curse that afflicts many countries that are overly dependent on natural resources. 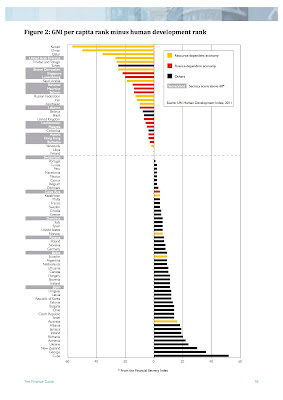 The graph here (click to enlarge it) provides a taster illustrating just one of many aspects of the issue. The press release is pasted below. A resource curse casts a shadow over certain mineral- and oil-rich nations damaging their economic growth and development. Now a new e-book by Nicholas Shaxson, author of the acclaimed Treasure Islands, and John Christensen, Director of the Tax Justice Network, shows that countries with oversized financial services suffer similar fates. As the resource curse stalks Nigeria, Angola and the Democratic Republic of Congo; so a finance curse has captured the UK, Cyprus and Jersey. generating and extracting unproductive and harmful economic ‘rents’. For decades, the expansion of a country’s financial sector was widely thought to benefit its economy. But The Finance Curse presents the first comprehensive analysis of the many harms that flow from hosting oversized financial centres. Despite the trillions flowing into and through the City of London and Wall Street, Britain and the U.S. perform worse in inequality, infant mortality and poverty than Germany, Sweden, Canada and most of their rich peers. Several new studies from the IMF and Bank for International Settlements show when finance gets too big – such as when credit to the private sector reaches 100% of GDP or more – growth suffers. The U.S Ireland, the UK, Spain and Portugal and Cyprus, all hit hard by the financial crisis, were all close to or above 200%. Claims that the UK’s finance sector contributes over £63bn in tax annually are wildly exaggerated and disingenuous. The true figure policymakers should reflect on is at most £20bn, and could be as low as £2.7bn. Likewise, policymakers must disregard claims the UK finance sector employs two million people. The relevant figure is a fraction of that. Against these smaller gross ‘contributions’ are a host of tax losses, not only from the bailouts. The true net tax ‘contribution’ of finance in the UK is negative. The near total ‘capture’ of politics in small island states lead to authoritarian tendencies that aggressively scapegoat dissenters. The British tax haven of Jersey, as one former minister puts it, is run by a “gangster regime” and a “crypto-feudal oligarchy captured by the international offshore banking industry.” In the UK, critics of the City establishment are subtly ostracised, and financial law enforcement is strongly discouraged. Finance has severely worsened imbalances between regions in Britain, with the “metropolitanisation of gains and the nationalisation of losses.” The financial lobby’s insistence on new transport infrastructure focused on London means more money is spent lengthening platforms at one London train station than on all the upgrades to Manchester’s rail network and the all-important link to Liverpool. In Jersey, where finance makes up over 50% of GDP, finance has decimated other industrial sectors and dramatically increased inequality. House prices grew by a stunning 29% annually in the 25 years to 2010. In Cyprus, well over 40% of all student enrolments feed its tax haven sector. In larger jurisdictions like Britain or the U.S these issues are clouded by background noise from large, complex democracies. 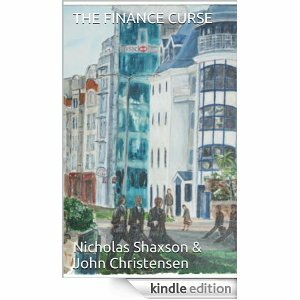 But in small financial centres and tax havens like Jersey or the Cayman islands, the Finance Curse is much easier to understand because finance is more dominant, and the issues are easier to spot. Tax havens therefore carry strong lessons – and warnings – for Britain and the United States in particular. As the well-remunerated finance sector recruits ever more graduates, in technical disciplines in the United States, there has been a steep decline in science, mathematics, engineering and technology – and a reduction in “entrepreneurial intentions” among skilled workers. The “financialisation” of large parts of the British economy has undermined business stability, productivity and employment prospects for large sections of the workforce, creating an ever-deepening economic trap that will be hard to escape. "The economic collapse in Cyprus highlighted how the Finance Curse hollows out the domestic economy of small islands and corrupts their entire political systems. I’ve seen exactly the same processes at work in my former home of Jersey. Alarmingly, the City of London is having similar effects on Britain. The Finance Curse presents a clear and present danger to social and economic development." "After spending 14 years living in and studying the Resource Curse in oil-rich countries in Africa, I was astonished to find the very same things happening in rich countries with big financial centres. Having an oversized financial centre in your neighbourhood is a bit like striking oil. It may well bring lots of money. But it will bring huge problems. And the evidence is overwhelming: too much finance is bad for you. Britain, the United States and many other countries need to shrink their financial centres dramatically. This goes way beyond the damage caused by the latest global financial and economic crisis. Once our politicians understand this, they will see that they can tax and regulate our financial sectors appropriately, with no loss of ‘competitiveness’ - even if other countries don't. When the financiers cry: ‘We will run away to Geneva or Hong Kong’ then that is to be welcomed. For if they do so, the financial sector will shrink and many benefits are likely to ensue." A big finance sector is good for an economy - isn't it? Actually, no. [i] Nicholas Shaxson is author of Poisoned Wells, a book about the Resource Curse based on 14 years’ research in West Africa; and also author of Treasure Islands, a book about tax havens and financial centres. John Christensen is the former economic adviser to the British Crown Dependency of Jersey, a pre-eminent British tax haven. He is now the director of the Tax Justice Network.